Potential buyers should remember the old advert — the quality goes in before the name goes on. People do not look at the design and quality of Fabergé objects, they just say, BUT it is signed. Marks can be added, quality cannot. Christel McCanless: How does one judge design and quality to become a discerning collector? Peter Schaffer: An easy way, after becoming somewhat familiar with the literature of Fabergé as well as the social and political history of the Romanov era, is to visit auction previews, exhibitions and museum collections. At previews the potential buyer can examine pieces and study the object’s description in the auction catalog with the piece in hand. The suggested rule of thumb is: Look at the style — Touch the piece — Examine the quality. Are there any discrepancies? Efforts in descriptions to connect the mystique of the Romanovs and Russian society of the time to an object can also lead to questionable results. Recalling a frame, later determined to be a fake, I recall its twisted exterior and cracked enamel with marks under it, and two totally pristine panels. The damage should have been over the entire piece, not just the borders. The amount of damage to the frame had to have affected the main panels too. Finally, if the object is over-the-top (OTT) or too perfect, be careful. CM: Can one learn about quality? PS: Yes! Remember, Fabergé made run-of-the-mill pieces and spectacular pieces, including the Imperial Easter Eggs. At A La Vieille Russie we have the stunning Princess of the Sea bell push – it has poor quality rubies on the top and four poor emeralds, yet the piece sparkles because of its flowing design. A fake with very good stones would detract from the design and probably be much heavier, so let the piece talk to you — use your imagination. In our shop I have convinced individuals, who insist they cannot trust themselves on quality, by asking them to sort five emerald rings without price tickets. Based on aesthetic appeal, color, and clarity, folks put them in order 100% of the time – the visual impact reigns. CM: How does a collector decide what kind of object to collect? PS: If the collector does not have a passion for a particular kind of object, I suggest he spend a day at the Metropolitan Museum of Art, or better yet, at a Fabergé exhibition or museum collection. Step inside as many galleries as you can in a morning and quickly look from left to right and allow the mind to see the objects on display. Do not stop for details, but during lunch make notes about the pieces the mind recalls most vividly. Returning to the museum in the afternoon, examine in detail the pieces recalled at lunch and let the visual impact guide you. CM: In your power point program you shared a technique used to authenticate pieces. What is it? PS. I showed my audience Fabergé objects with increased magnification from one view to the next. If the larger images continue to hold up to this detailed scrutiny, then it tells me it is a real Fabergé. Fakes cannot take this kind of close examination – the quality dissipates quickly. 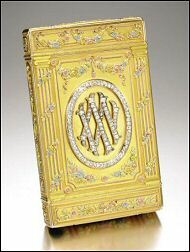 At the recent Grosvenor House Antiques Fair, the London Fabergé dealer Wartski featured a blow-up photograph of a large yellow Fabergé box in its center display case — a fascinating application of this technique. CM: Modern photography can do wonderful things to Fabergé objects, please share an interesting experience or two with our readers. PS: We were offered a fish carving illustrated in an 8 x 10 inch colored photograph with the fish covering the paper from one edge to the other. In reality, however, the Fabergé fish was a mere 1½ inches long, and we nicknamed it “the whale”. The erroneous assumption was corrected quickly, when we examined the delicate and very realistic Fabergé carving without marks. Collectors should know most animals and flowers do not have marks. On pendant or miniature eggs, as a general rule, the marks should be on the main ring of the egg rather than the loose one. My most recent experience with photographic size distortions has been with the Blue Serpent Clock Egg last exhibited in 1992, and not seen publicly again until its unveiling at the Consulate General of Monaco in New York City in late 2008. The Egg Clock is a tiny (only 7¼ inches tall), incredibly wonderful egg, which in the 16 years out of the public eye, has only been known from photographs. It is always illustrated the same size as the 1902 Duchess of Marlborough Egg which is 19¼ inches tall and almost three times the size of the Blue Serpent Clock Egg. CM: Tell me more about “run-of-the-mill” pieces. PS: For Fabergé’s artisans to produce several hundred thousand objects in the short period of time between 1885 and 1917, the complex process of enameling, gold- and silver smithing required certain standards, but these processes did not follow rigid rules. By taking these objets d’art apart and through the careful observations of modern restorers, we know the craftsman’s major effort was on the outside of the object, and the non-visible inside was completely functional and very simple. For example, friction fits (i.e., the object has no screws nor glue, just a proper fit), screws serving as decorations, and simple triangular tabs used to hold photographs in place, were sufficient. Enameling was done either on silver or gold, resulting in the same color appearing different depending on the metal used. Silver struts were combined with gold fronts. I remember an object acquired at auction, later displayed in an exhibition with a lengthy curatorial essay in the exhibition catalog in which the author suggests the Fabergé piece is not genuine. The curator made this assumption because of some non-matching technicalities. This anomaly had already been recognized and dismissed by the collector and his agent, who had handled many Fabergé pieces in his lifetime and had a keen eye. By the same token, Mr. William Randolph Hearst, Sr., insisted repeatedly that my father, Alexander Schaffer, give him the history for a piece – there was no basis for the information and to this day the object carries this unproven provenance. In summary, Fabergé pieces are elegant on the outside, simple and functional on the non-visible inside, and therefore, caveat emptor in applying hard and fast rules on workmanship, and accepting provenances without additional research and an open mind. CM: When did you realize stepping back and allowing the mind to see a work of art first, before touching it and examining its qualities, were sequential steps in unlocking the mysteries of Fabergé? 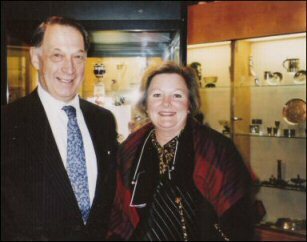 PS: It was when my brother Paul and I first joined my parents, Alexander and Ray Schaffer, in the family business. My father showed us a snuffbox and challenged us to date it and state the country of origin. After a quick look, I placed the snuffbox in the time frame of 1830, Swiss, but not Fabergé. The next discovery occurred as I struggled to open it. Fabergé boxes open easily and close gently without any noise. Finally, the marks for both Moscow and St. Petersburg on the front of the box gave the forgery away. As an 1830 snuffbox, the monetary value was more than a fake Fabergé at that time. I want to tell you about a friend of ours with a unique talent. His ability to spot genuine Fabergé objects was unbelievable. At a swap meet with his ‘magic eye’ he spotted a Fabergé kovsh selling for $17 (yes, seventeen dollars). Years later, the same kovsh sold from his estate for a sum of six digits. CM: In conclusion, briefly summarize our phone interview. PS: Step back and allow the mind to see the Fabergé objet d’art and don’t just look at the marks and the written words before you make a decision to buy Fabergé. Hopefully, you will avoid the thousands of fakes on the market. Four cigarette cases and an antique silver coffee service. 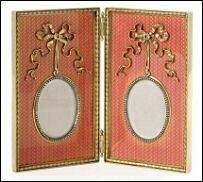 A frame, cigarette case and parasol handle. Highlights include a cigarette case with an Imperial eagle, a folding screen photograph frame (both pictured below), and a pendant icon of Christ Pantocrator. A perfume bottle (left), a brooch and cane handle (right). 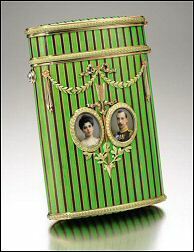 The descendants of Grand Duchess Maria Pavlovna are offering at auction cigarette boxes, cufflinks and Fabergé items. A recent publication, Hidden Treasures of the Romanovs by William Clarke, and the rediscovery of personal property of Grand Duchess Maria Pavlovna (1854-1920) provide unique historical insights into the turbulent times during and after the Russian Revolution. 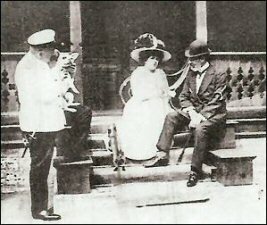 Clarke, also the author of Lost Fortune of the Tsars (1994), in his new book describes how British aristocrat and diplomatic courier, Albert Henry Stopford, risked his life breaking into the Vladimir Palace, home of Maria Pavlovna and Grand Duke Vladimir Alexandrovich (1847-1909), to rescue Romanov jewels. Maria Pavlovna, prominent hostess in St. Petersburg, described as ‘the grandest of the grand duchesses’ escaped from Russia in 1918, and finally in 1920 settled in France where she died shortly after her arrival. In November 1918 (a month before Sweden broke off diplomatic relations with the Russian revolutionary government) approximately 100 objects belonging to Maria Pavlovna were deposited at the Swedish Legation in St. Petersburg. They lay undisturbed in a dusty archive in the Swedish ministry in Stockholm until their rediscovery in 2009 (91 years later) during a renovation project. The editors of the Fabergé Research Newsletter wish to thank Galina Korneva and Tatiana Cheboksarova, experts on Maria Pavlovna and consultants for the Sotheby’s auction, for their article in the Research Corner (below) on Grand Duke Alexei Alexandrovich, brother-in-law of Maria Pavlovna. 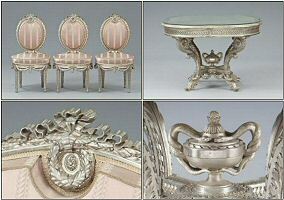 Two Finnish auction houses celebrating anniversaries are offering a total of 18 pieces of furniture from the Silver Set. Originally the set adorned the Silver salon of Empress Alexandra Feodorovna in the Winter Palace, and was made in master craftsman N.F. Svirsky’s carpentry shop in St. Petersburg in 1894. Its designer was the architect N.V. Nabokov, who planned the decor for all of Tsar Nicholas II and Alexandra Feodorovna’s private rooms. In January 2009, eleven pieces of this historic set were found and were to be offered at auction by Bukowskis Helsinki, but due an ownership dispute they were withdrawn. The worldwide publicity helped another owner of a 12-piece set recognize his treasure, and it is being offered by the same auction house on December 13-14, 2009. Hagelstam Fine Art Auctioneers is offering the previous day, December 12, 2009, six pieces from the Silver Set with the following provenance – purchased by a Finnish gentleman in the 1920-30s, stayed with the same owner until sold by the family in 1975, and now consigned by a widow living in Helsinki. Research on this historical Silver Set continues and so does the hunt for additional pieces. (Our thanks to Maria Ekman-Kolari of Bukowskis and Marjaleena Lindberg of Helsinki for sharing details of these auctions). The exhibition reviews Finnish jewellery through the centuries, from the Renaissance to contemporary conceptual art jewellery. The exhibition includes a gallery named The Tradition from St. Petersburg, which shows jewellery by Fabergé’s Finnish workmasters. Ulla Tillander-Godenhielm is assisting with the venue. Three seldom seen Fabergé eggs – the 1906 Swan and the 1908 Peacock Eggs, both given by the Tsar Nicholas II to his mother Marie Feodorovna, and the 1907 Yusupov Egg, a 25th wedding anniversary present from Prince Felix Yusupov to his wife Zenaïde, are owned by the Sandoz Foundation in Lausanne, Switzerland. Maurice Sandoz (1892-1958), a collector of watches, jewelry and automatons as well as an author of literary works in five languages (French, English, German, Italian, Portuguese) donated part of his collection to the Le Musée d’Horlogerie. For the 50th anniversary of the Museum located in the Château des Monts in LeLocle, Switzerland, the Fabergé eggs from the Sandoz collection are shown on rotation through October 31, 2009. At press time the Swan Egg is on display. 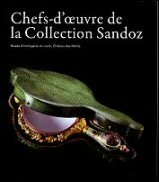 Coinciding with this exhibition is the publication, Chefs-d’…uvre de la Collection Sandoz, with new photos of the eggs. 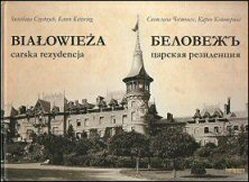 The Imperial Palace (built in 1889-1894) and the hunting lodge at Białowieża, Poland, are featured in 57 old photographs taken by Z. Karasik and found in the Archives of the Chancellery of the Ministry of the Imperial Court. Made for the Grand Duke Vladimir Alexandrovich, the sepia photographs are featured in a book by Svetlana Iurevna Chestnykh and Karen Kettering entitled Białowieża Carska Rezydencja (Беловежь Царская Резиденция). With railroad access after 1897, the Palace and surrounding forest became the favorite place for Nicholas II and his family to hunt, rest and relax in 1897, 1900, 1903, 1906, and 1912. Carol Warner of Washington (DC) shared a photo of the December 1992 Fabergé from Private Collections exhibition at Wartski, London. In the background is the Blue Serpent Clock Egg not seen again until its 2008-2009 American tour – New York, Cleveland, and San Francisco. Grand Duke Alexei Alexandrovich during his lifetime maintained a luxurious palace in St. Petersburg, Moika emb. 122, and an apartment in Paris at Gabriel avenue 38. The land of his Russian estate was valued at 1 million 170 000 rubles. After his unexpected death on November 1, 1908, some 500 paintings and other art objects from his Paris apartment were sent in eight huge crates to St. Petersburg. The contents included a silver pheasant by Fabergé estimated at 500 rubles, paintings of famous French artists Jean-Baptiste Marie Huet (1745-1811), François Boucher (1703-1770), François Flameng (1856-1923). Insured value of the shipment was 250,000 French francs. His career as the commander of the Imperial Russian fleet ended in 1905 during the Russo-Japanese War, when he was relieved of his command and he retired. Always a generous giver of gifts, after his death it was necessary to pay a Fabergé invoice of 800 rubles for a hardstone figure of a dog Grand Duke Alexei had presented to actress Elizabeth Balletta of the Imperial Mikhailov Theatre. (Ed. note: The authors have advised 800 rubles was a huge sum. Their grandmother told them that in 1903 it was possible for three persons to live on only three rubles for a month! In comparison, the annual salary of Victor Shreter, Court architect of Grand Duke Vladimir, brother of Alexei Alexandrovich, was 500 rubles). 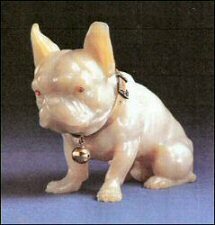 Almost 70 years later a carved agate Fabergé dog with a golden collar and a golden bell inscribed Cody. Av. Bosquet 9 (Madame Balletta’s address in Paris) was sold at auction for Swiss francs 65,000 (Christie’s, Geneva, November 19, 1974, lot 282; Sotheby’s New York, June 28-29, 1979, lot 405, passed in or withdrawn). Dogs owned by Fabergé customers were favorite models. It has not yet been determined, if the dog held by Grand Duke Alexei in this photo is perhaps Cody. Grand Duke Alexei had no official family and all his movable and immovable property was to be shared with the rightful heirs, his brothers, the Grand Dukes Vladimir and Pavel. In February 1909, Grand Duke Vladimir Alexandrovich died suddenly and his share of Alexei’s heritage passed to his wife, Grand Duchess Maria Pavlovna the Elder (1854-1920). The Office of her Court was in charge of all questions connected to the inheritance, staff, estates affairs, money and debts of the late Grand Duke Alexei Alexandrovich. 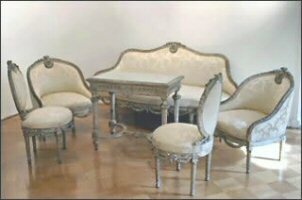 On Friday 8 of May I saw in the halls of Auction at Moika the second run of things, that belonged to the late Grand Duke Alexei Alexandrovich, and that is why I believe that you had already gotten consent of Grand Duke Pavel Alexandrovich to sell them. In connection with it, I ask you to inform me when I could send for the things that Grand Duchess Maria Pavlovna allowed me to choose and that she promised to let me have according to billing rates, as you had told me earlier. About the other things, that I declined to estimate them despite your invitation to do it, I would like to ask you in order to make the right valuation, even by the same gentlemen from the Auction. Pending your amiable news I ask you, Your Excellency, to take assurance in my absolute respect and devotion. 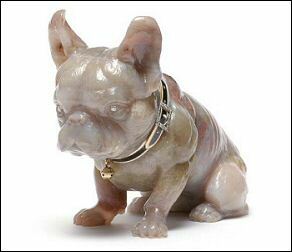 Wartski of London on its web page showcases a well-documented Fabergé bulldog sold to Mrs. J. A. Mango in London on November 16, 1916, at a cost of £90, and described in 2009 as ‘one of the best Faberge animals’. The features of the Mango bulldog appear to be quite similar to Cody belonging to Mme. 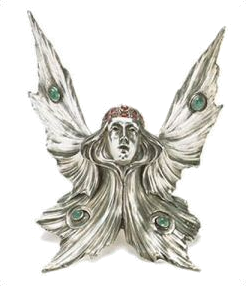 Balletta (shown above). They are both 9 cm (3½ inches) tall, the first made out of petrified wood with eyes set with two large old brilliant-cut diamonds, and the second carved from bowenite with gold-mounted cabochon ruby eyes, dated ca. 1910. The Lowes and McCanless Index to Fabergé at Auction, 1932-2005, contains close to 50 auction lots of bulldogs attributed to Fabergé varying in size from 1½ to 3½ inches in seated or standing positions, carved from nephrite, bloodstone, agate, river spar, in silver, etc., with or without collars, and a few with workmasters marks. A quick examination of the auctions lots raises authenticity questions. More recent Fabergé research would suggest the term in the style of Fabergé for some of these bulldogs would be more appropriate.